Bilbao, Spain (WAM) — Production capacity of Abu Dhabi National Oil Company (ADNOC) 's Habshan gas processing plant will surge within two years to five billion cubic feet of natural gas per day from its current level of 3.5 bcfd. "Habshan is considered one of the largest gas processing plants in the world. It is going to be expanded within two years, along with other gas plants in other offshore and onshore areas in the UAE," Yousef Omeir Bin Yousef, Secretary General of the Supreme Petroleum Council and CEO of ADNOC said on March 16 in a speech delivered at the opening of GASTECH 2005 conference and exhibition. Bin Yousef urged closer cooperation between gas producers and consumers in order to create "a stable natural gas market." He added that in the coming few years, the world's gas production will out-pace the oil production by almost the double. He announced that the next edition of the event, GASTECH 2006, will be held in Abu Dhabi, from 4 - 7 December, 2006. ADNOC and its group of companies will be the main hosts of Gastech 2006. Dolphin Energy Limited will co-host this event with ADNOC. 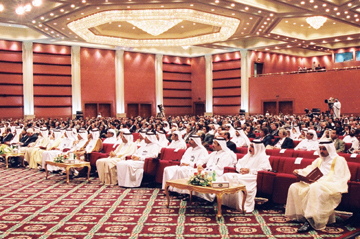 This important event will be held at Abu Dhabi International Exhibition Center (GEC) and the Emirates Palace. "I would personally like to thank the Government and people of Spain and the Basque for their hospitality during our visit and participation at GASTECH 2005." "ADNOC is delighted to be hosting this prestigious event along with Dolphin Energy, for the very first time in the UAE. We look forward to welcoming our guests in Abu Dhabi next year."